A Skoda Octavia was once the least sophisticated of all the Volkswagen Group's family hatchback products. Not any more. Almost nothing has been held back for this third generation version, which now features smarter looks, new hi-tech 1.0 and 1.5-litre TSI petrol engines, the option of adaptive damping further up the range and more sophisticated optional smartphone connectivity. You can trace the Skoda success story of the last couple of decades back to the original launch of one model: this one - the Octavia. Right from its very first appearance in 1996, this has been a car that's always super-sized its value proposition, offering more space than the class norm. For first and second generation versions, that class saw competition amongst Focus and Astra-class family hatches. This MK3 model though, took a step up in the world, virtually big enough to compete with Mondeos and Insignias in the larger medium range segment. An Octavia then, that's larger than previous generation versions were - and cleverer too - as it has to be to distance itself from the simpler, smaller Rapid model. The Rapid is the car to choose for Skoda motoring as it used to be, light on frills and cutting-edge technology but solid, reliable, value-laden and built to last. This improved Octavia, in contrast, is more a signpost to a direction the Czech brand wants to go in the future: one that shares the very latest technology with more luxurious brands in the Volkswagen Group stable. As with the Volkswagen Golf and the SEAT Leon, the German engineers who created this car took a pragmatic approach to driving dynamics, deciding that drivers opting for lower order engines wouldn't care too much about cutting edge handling response. 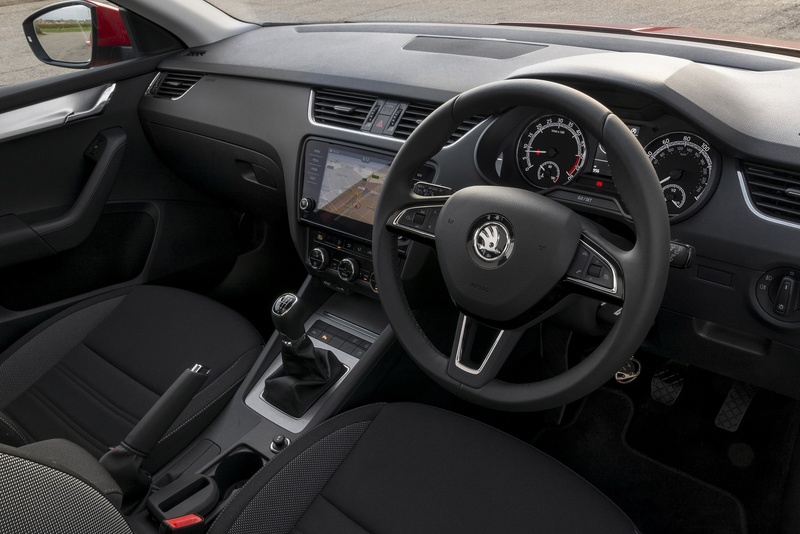 So the sophisticated multilink rear suspension is reserved for the performance-oriented vRS models, the most powerful of which uses the 2.0-litre TSI petrol unit borrowed from the Golf GTI. Here though, we're focusing on the mainstream variants that most Octavia customers will be considering, all suspended with a much humbler torsion beam arrangement. A very large proportion of customers opt for entry-level petrol power, previously a 1.2-litre unit but now a more frugal and sophisticated 1.0-litre engine developing 115PS and 200NM of torque. It can be ordered with or without 7-speed DSG auto transmission and in manual form, makes 62mph in 9.6s. Otherwise, the engines on offer are much as before. Petrol people get a 1.5 TSI 150PS ACT unit or, in the top vRS performance models, a 245PS version of the 2.0 TSI turbo unit borrowed from the Golf GTI. Those in search of a diesel get either a 115PS 1.6 or a 150PS version of the usual 2.0 TDI unit, which is available with 184PS in the vRS. Opt for an engine with 150PS or more and you get the option of DCC adaptive damping. 4WD is an option with the 2.0 TDI engine. And handling? Well as we suggested at the beginning, it isn't really geared towards the needs of the enthusiast driver, though to be fair, bodyroll is well controlled and the steering direct and precise. If you're after more than that, then you'll appreciate one of the sporty vRS models. Horses for courses you see. And if those courses are likely to be on the rough and muddy side, then you'll be interested in the four-wheel drive system also developed for this car, primarily for a Scout estate model with additional body cladding and a raised ride height. Skoda people will probably quite like the fact that the look and feel of this car doesn't attract too much attention, even in this updated form where the lines have been streamlined, especially at the front. The two adjacent headlights form a dual face with a crystalline look and feature full-LED technology. The brand logo has gained more presence, with the front of the car featuring what the Czech maker hopes is a more powerful and wider appearance. Of course, it remains just as spacious as before and you get a feel for that when you lift the heavy bootlid. The cargo area is absolutely huge, the 590-litre capacity reached over a notably low lip and the space on offer almost double what you'd get in a comparably-priced Ford Focus and over 50% more than you'd get in a Volkswagen Golf. There's 610-litres if you go for the Octavia estate model. Has all this been achieved at the expense of rear seat occupants? It seems not. Enter in through the wide door openings and you'll find more headroom and elbow width than you'd get in comparably-sized Focus-class competitors too. Up front, you still wouldn't think you were in an Audi but everything's certainly much more Volkswagen-like these days in terms both of fit and finish, the feeling supposed to equate to that of 'wearing a well tailored suit', according to the design team. So-called 'Simply Clever' features include an allergen filter for the Climatronic air conditioner, an optional rear-view camera that's kept clean using washer jets and an optional umbrella under the front passenger seat. Plus iPads can be mounted to the front seats' backrests. Expect to pay somewhere in the £18,000 to £33,000 bracket for mainstream versions of this Octavia. Should you want the spacious estate rather than the five-door model, then there's an £800 model-for-model premium to find. The UK best seller will be the 115PS 1.6-litre TDI diesel version, a variant that commands a £1,000 premium over the similarly powerful 1.0-litre TSI petrol alternative. These are the two engines you'll find in most UK Octavias. Want an alternative? Well if you're a petrol person, there's a £1,000 jump to go from the 1.0 TSI to the 1.5. And if you're a diesel driver, there's a £700 premium to go from the 1.6-litre TDI to the 150PS 2.0-litre alternative. If, having considered all of that, you decide that this is the car you want, then you're going to want a strong standard specification to be part of the deal. And by and large, you shouldn't be disappointed. The two bodystyles - hatch and estate - are mated with eight main trim levels - S, SE, SE Drive, SE L, Sportline, Laurin & Klement, Scout and vRS. Whichever one you choose, your car will come with alloy wheels, tinted glass, climate-controlled air conditioning that also cools the glovebox, a height-adjustable driver's seat, a four-spoke leather-covered steering wheel, a trip computer, an eight-speaker stereo with a DAB digital radio and USB and AUX-in sockets and a hill holder clutch that stops you from drifting backwards on uphill junctions. The optional Skoda Phonebox with wireless charging connects a smartphone to the car antenna by near-field coupling without the need for a cable, thus offering high call quality and best data reception. The big news for Octavia buyers in recent times is that a turbo-charged, three-cylinder petrol engine has replaced the 1.2-litre, four-cylinder variant at the foot of the range. From its engine size of 999cc, the 1.0 TSI powerplant produces 115PS and is 8% more efficient than the previous 1.2 TSI unit. The 1.0 hatchback with manual transmission can return up to 50.4mpg, while emitting 107g/km of CO2. Go for the 1.5 TSI ACT powerplant and you're looking at 48.7mpg on the combined cycle and 112g/km of CO2. The rest of the engine range is also very efficiency-minded. Best of the bunch is the 1.6-litre TDI diesel, able to return up to 58.9mpg on the combined cycle and up to 107g/km of CO2, thanks to a Start/stop system that cuts then engine when you don't need it, stuck in traffic or waiting at the lights. Opt for the pokier 150PS 2.0-litre TDI diesel and you can expect 56.5mpg and 111g/km of CO2. All figures are WLTP-rated. What else? Well, insurance ranges between groups 13 to 20 on the 1-50 scale for mainstream models. There's the usual three year / 60,000 mile warranty. And there's the choice between fixed or flexible servicing regimes, depending on whether your annual mileage is short or long. If you�re looking for a new SKODA Octavia 1.5 TSI SE L 5dr DSG Petrol Hatchback for sale, you�ve come to the right place. At Bristol Street Motors we don�t just have the best SKODA Octavia 1.5 TSI SE L 5dr DSG Petrol Hatchback deals, we also offer friendly advice and help with all your enquiries to ensure your buying experience is a happy experience.